It was very clear: hundreds of people had had the same idea: let’s try out the new cycleway alongside the new canal. So the first Sunday it was open, the route was very busy with people cycling and walking. The new canal runs between ʼs-Hertogenbosch and Rosmalen (which is also part of the ʼs-Hertogenbosch municipality) and it has a beautiful cycleway running alongside of it, all the way. All sorts of people trying out the new cycle route alongside the new Máxima Canal. The new canal replaces a canal that runs right through the historic city centre of ʼs-Hertogenbosch. That canal – to bypass the part of the river Meuse, that could not be used well by ships – was opened in 1826 and it had brought the city great prosperity. It was named after King Willem I, who decided this canal had to be built: Zuid-Willemsvaart (“South-William’s Canal”). The canal is 125km long and starts in Liège. That is now a city in Belgium, but at the time it was part of the ‘United Kingdom of the Netherlands’, which included the entire Benelux; present-day Belgium, Netherlands and Luxemburg. The canal ended at ʼs-Hertogenbosch, from where the Meuse could be used much better. The new canal bypasses ʼs-Hertogenbosch while the old canal ran right through its historic city centre. The red line is the new cycle route. In the south the dots indicate where it is not finished yet. In the north the dots indicate where it is only a dirt-path on the flood plains. Already in 1983 the government had decided that the old canal had to be upgraded for modern class IV ships. One class IV ship, with containers stacked in three layers, can replace 100 heavy goods vehicles (HGV’s) and that would reduce congestion and it would also be better for the environment. In the city, however, the canal was only 7 metres wide. For class IV ships it would need to be more than six times as wide! But since it was running through the dense old city centre, there was no way to widen it there. It took the government 10 years to figure that out and in 1993 a procedure started to see what the environmental impacts of this canal would be. That was also the year I started working for the Commission for Environmental Assessment, so I have followed this procedure not only as a resident, but also from my work perspective, for over 20 years now. It is the first time I can link to my work-site from this personal site. All the investigations and the entire decision making process took until October 2011, when a final decision by the minister of Transport was taken (and later approved by the highest court). Some of the preparing measures had already started, so right away the digging could start. Three years later, the new canal was ready to be used by ships, in December 2014. In the mean time, the canal further south was widened at it’s original location, because it was possible to do that without a bypass there. 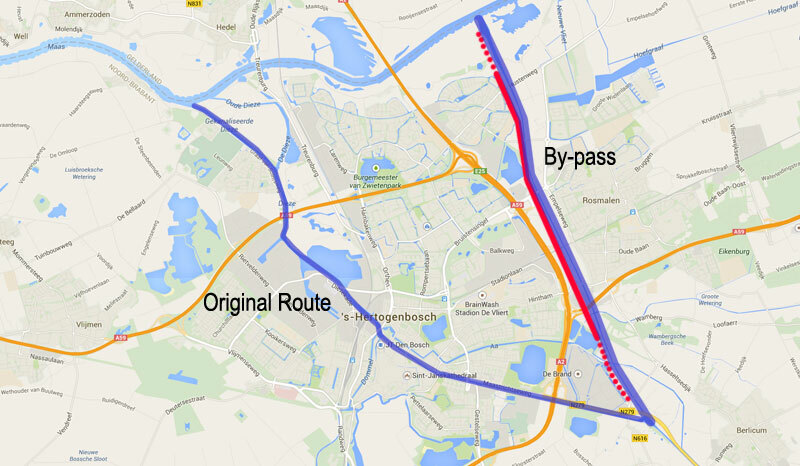 As is usual in the Netherlands, when we create a bypass, the original route can no longer be used. The locks in the old-canal and the bridges will no longer be operated. So that forces (even the smaller) ships to use the new bypass. Because the old canal will not be removed, the bypass canal got a new name. It was named after our present queen: Máximakanaal and she had the honour to open it herself on 5 March last. That day most of the cycleway was also opened. The canal is 9 kilometres long and the cycleway will be 7.6 kilometres long. I can tell you that so precisely because the cycleway has hectometre signs alongside of it, so you can see exactly how long it is and how far you already cycled. The first part is not entirely finished yet. There were some problems to overcome during the construction of the canal, one of which was a leak. The first kilometre of the canal had to be re-sealed because too much water seeped to the (lower lying) fields alongside of it. Where that fault had to be remedied the cycleway is now not ready yet. There won’t be a road alongside of the canal, only a cycleway. Cycleroutes that do not follow a road are always bi-directional, so that is also the case here. Since this cycleway is nowhere near a road to distinguish it from, the cycleway does not have to be red. That is the reason the smooth asphalt surface is black. 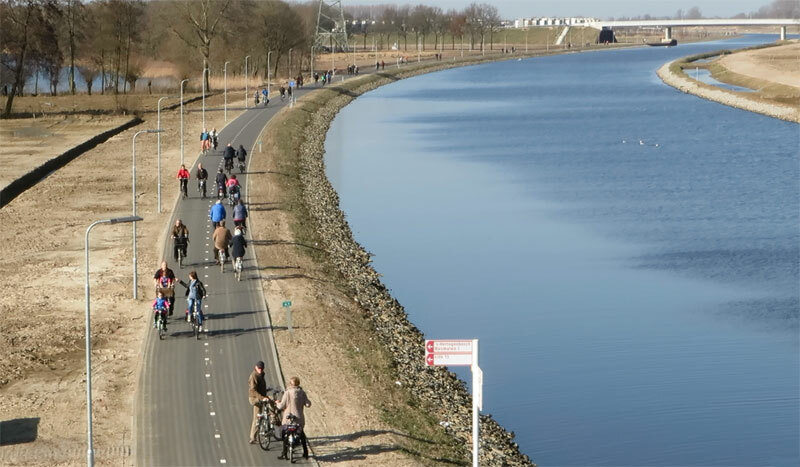 The busy bi-directional cycleway in black asphalt alongside of the canal on the first Sunday after it was opened. The canal forms a new barrier in the landscape, so new crossing possibilities had to be created. A total of 8 similar looking bridges were constructed. One for trains and 7 that can be used by cars. All but one of the bridges can be used for cycling. Only the motorway A59 bridge has no cycleway. But right under that bridge people can cycle over the lock, so there are still 8 possibilities to cross the new canal when you cycle (or walk). There are two locks in the new canal, one at either end, at Hintham and Empel. The city of ʼs-Hertogenbosch had wanted to build one cycle bridge at normal street level. So people would not have to cycle up the 7 metre tall bridge at that location. But Rijkswaterstaat (the governmental body constructing the canal) was opposed to bridges that had to be opened for ships and they got it their way in the end. That means the only place where you do not have to cycle up a large bridge is at the south lock near Hintham. Because of its location, I think that will be a well-used crossing for people cycling from the village of Berlicum to ʼs-Hertogenbosch. Among others, a lot of school children will use that route and they will not have to cycle up a tall bridge. The canal is now finished, but the landscaping around it is not. Many trees are being planted (one for every tree that had to be removed) and a large park along the entire canal will be constructed. In the video it all looks very barren and sandy, but that will change soon enough. Given the soil and our climate, it will be green in just a couple of months. “Cycleway from Den Bosch to Veghel”. The province announced yesterday that there will be one more cycleway alongside the canal. 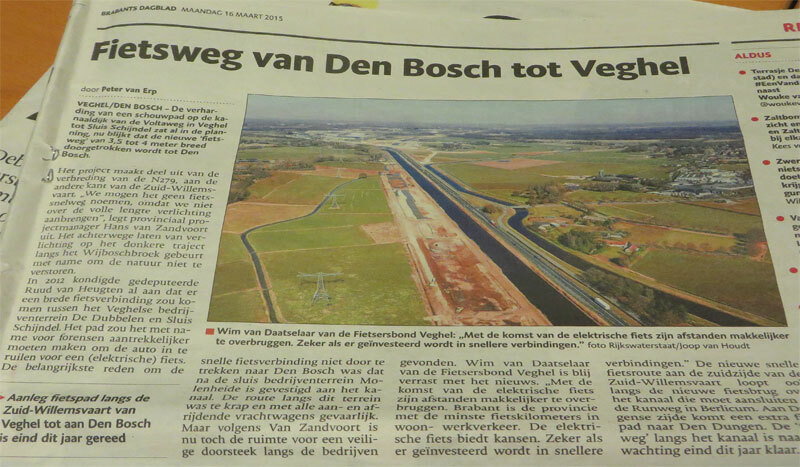 The province of North-Brabant announced in the local paper of Monday 16th March 2015, that there is more good news regarding the canal and cycling. From about the starting point of the cycle route of this post, further south along the widened original canal, a cycle path will be built as well! That will make cycling in an almost straight line possible from ʼs-Hertogenbosch (aka Den Bosch) to Veghel (about 15 kilometres). The cycleway will be 4 metres wide and it will have a surface of smooth asphalt. The only reason why it cannot officially be called a “fast cycle route” is that this route will not be lit at night, at least not entirely. That is not possible, because it would disturb wildlife in a nature reserve that the path runs past. This new cycleway, announced now, will already be finished by the end of 2015. That is possible because there already is a (private) maintenance path for the canal, that only has to be surfaced with asphalt to make it suitable for cycling. I wrote about this new route after it was opened. The path on the other side of the canal has now sprung into existence too. It seems to not be officially open yet, but the fences closing it off can either be opened or cycled around, so they don’t stop anyone. What’s remarkable is the difference between the two. While the Mariannepad is a wide, concrete, fast cycle route, the Paulinapad seems to be made of hardened earth. It’s more a recreational route, which is well in line with the intended development of that side of the canal into a park. Dual provision the Dutch way! Nice article, thanks again Mark :-). Just wondering, is there any rhyme or reason behind why bidirectional cycle paths sometimes have a dashed white centre line, and sometimes don’t? I would have thought that they should always have them to show to all users that it is 2 way. I think the part you refer to was labeled “Mariennepad” (I don’t remember the exact spelling). This seems to be where a shared cycle-car path begins. The path widened here, also. When the dashed line starts again the drivers must leave the path (they cannot continue forward on the cycle path). Yes, that would be much better. But unfortunately that is not the case. The centre lines on cycle paths seem to be optional. If I follow the link to your workplace’s website, it says you are called MJF Car Neighbour? Finally, the truth is out! At least those with worse names have processes to change their names. When I saw your last name, I thought your family had a history of being the friendly neighbourhood cart peddlers. What is the MJF part about? You might want to reconsider that translation, many bad associations to the word 🙂 Maintenance path would be a more typical description. What on earth would a surveillance path be? It’s a path that is used to optically inspect the state of the canal. To see that there are no leaks or other damages etc. This is done regularly by driving along the entire canal on that path and just looking at the canal. So it was already established that the correct translation should be ‘maintenance path’. Oh, I was thinking that you were saying the connotation would be a pathway that the CIA uses to get to the people they want to spy on. Its sort of fine if you want to ride at a very steady pace. 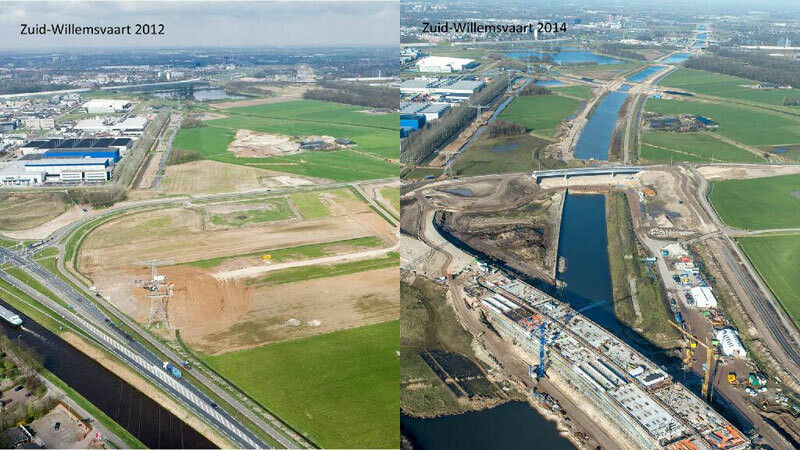 I am sure it will be used as an example as how wonderful dutch infrastructure is. However, its not scalable as a model for a transport network across a country. The construction of the canal has created a level separated route across existing roads. It would cost millions per mile to do without the canal. If you don’t happen to live by the canal and want to go somewhere else on the canal you will have to use the rest of the road network. This is not supposed to be “a model for a transport network across a country”. It is an example of including cycling in whatever infrastructure you build, and how to do that in a good way. This path is very well connected to the rest of the cycling network. The blue signs with streetnames (in the video) incidate all the places where you can switch from this route to other directions. That makes this route more than just a single route for leisure activities, it is a very good route for a lot of people to cycle from A to B for their day to day destinations. By the way campaigners: good bicycle infrastructure benefits car driving as well. Less annoying slow cyclists on the road, less people using cars, so the roads are less congested. Car owners should be grateful and support bicycling as well. Gronignen has often been accused of resting on it’s laurels. It should expand the car free zone of the city, make more streets into cycle streets, change older cycle path surfaces from tile to smooth red asphalt, change intersections to be safer, make more roundabouts, switch more roundabouts from cycle lane to cycle path, change more cycle lanes in general to cycle path, widen some paths, add more simultaneous greens when the volumes justify it or when separate signalling would otherwise not be possible, and add more bike parking. Seems like a lot of people were walking there. Will the put in a footpath too? No, there won’t be a footpath, but I don’t expect it to be this busy with people walking, ever again. This was the first Sunday the path was open and also the first Sunday the temperature got over 10 degrees. Everybody was out and about. This was my first thought too. Reminiscent of many unpopular “shared use” facilities in the UK. This is not shared use. It is clearly signposted and marked as a cycle track, with the dashed line in the middle as a reminder that it is a two-way cycle track. The difference is that in NL, people may walk on cycle-only tracks if there is no footway but should look out for bikes and not obstruct people cycling unnecessarily. If people walking do go there, the cycle signage and road-like markings should intuitively tell people walking to keep out of the way of bikes. It is also wider than the typical UK foot/cycle shared path. In the UK, there are simply shared paths explicitly signposted with “cycle and walk” signs. Various organisations (councils, government cycling promotion campaigns, etc) say “go slow” and “give way to pedestrians”, i.e. these paths are not suitable for cycling at any decent speed. They are also typically narrower, of poorer surface, with blind bends etc. I had the same question as “Easy” and I was thinking of the same response. Do you know the residential population (in terms of people, and in housing units) within 1 mile of the cycle path? Andy T provides some good additional information below. Another great informative post. Thank you for these. It seems that everyone walking was doing so on the left. Is this common? Recommended? If I remember that law has been repealed quite some time ago. Reason was that it obliged walking right inside and walking left outside built-up area. No rule at all was considered less dangerous than a confusing rule like that. Some googling found me the date of this change: it was changed with the introduction of the Reglement verkeersregels en verkeerstekens 1990 in 1990/1991. So it’s almost 25 years now that people are allowed to walk on either side of the road. Wow, I completely missed that law-change and obviously many more people with me. I think it isn’t confusing at all. No sidewalk then you walk against traffic. I will also continue to do so, it feels much safer. Even though I hardly ever walk where there is no sidewalk. The confusing part was the difference between inside and outside bebouwde kom. Which in fact would be even more confusing in this case – the Empelsedijk is outside (walking left), the part of the cycleway where cars are allowed (around the Bruistensingel) are I think inside (and would then be walking right), but nowhere is a sign telling you when you go from outside to inside. Walking against traffic (where there is no sidewalk, no cycleway and walking in the berm is impossible or impracticle) as you say, is still the generally advised practice. Thanks Mark and everyone else. Here there is a debate with some saying ALWAYS walk/run against traffic and others saying walk/run against traffic on a street with motor vehicles but walk/run with traffic on a MUP (multi-use path) that has people walking and riding bicycles (as well as on a sidewalk). Must come down and try it, Mark. I’ll bring the electric bike so I can do the speeded up version – a thrilling ride! 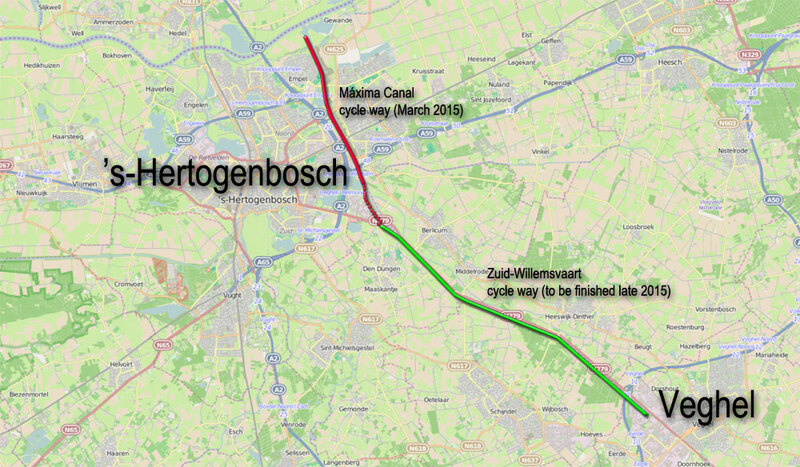 This entry was posted on 17 March 2015 by Bicycle Dutch in Original posts and tagged ’s-Hertogenbosch (Den Bosch), canal, infrastructure, long distance cycle paths.